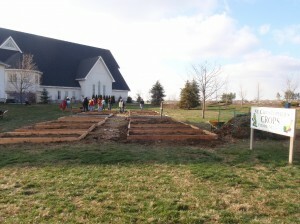 On December 5, 2009 34 people representing the Boy Scouts, church, and other groups worked together at St. Christopher’s Episcopal Church in Carmel to build 14 – 5′x10′ and 3 – 10′x10′ raised planting beds for the St. Christopher’s Crops garden ministry. This community garden provides fresh, wholesome organic produce to area food pantries for distribution to needy families. Youth directed the construction of the organic garden beds. It took 34 volunteers nearly 6 hours to build the 17 garden beds. Despite the cold weather, the youth cheerfully begin building the new organic garden beds. Carmel Area Roots & Shoots members visit the project site to thank everyone for their dedication to making Carmel a greener community. Church members of all ages help pick fresh organic vegetables from the garden to provide healthy foods for needy families at the food pantry. 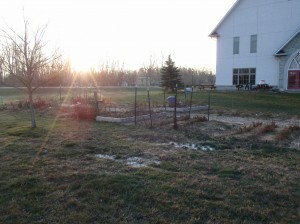 Update: With the new raised garden beds, (and a lot of Indiana rain,) St. Christopher’s Crops garden is thriving! Work Days are Saturday mornings at 8 am and Monday and Wednesday evenings at 6 pm. The church welcomes volunteers of all ages and denominations to come by and harvest, weed and help with garden maintenance. Upon harvest the nutritious, organic crops are donated to area food pantries. To find up to date information on the garden click here.